Eli Reich knows how to find the silver lining… and then reduce, reuse and recycle it so none of the optimism is wasted. When his messenger bag was stolen, Eli started thinking about how to make a replacement. 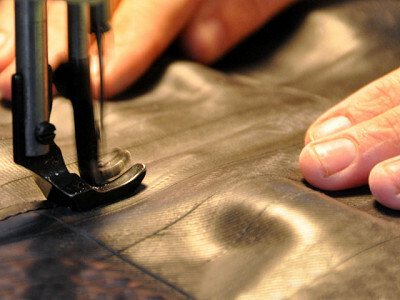 Working with a pile of extra inner tubes, he started sewing. Today, Eli’s company, Alchemy Goods, transforms blown-out inner tubes, old seatbelts and advertising banners into new bags and accessories -- and he thanks the messenger bag thief for the creative inspiration. Eli’s Ballard belt is made from reclaimed bike tubes that stretch just enough to be comfortable but won’t lose their shape. It comes with a removable steel buckle. For grooming essentials, the fully lined Elliot Toiletry Bag has a water-resistant exterior made from truck inner tubes and a zipper pull made from a tube valve. All the materials are sorted, cut, cleaned and prepped in the company’s Seattle workshop, and the bags are assembled at a local sewing shop. A tiny number on the logo shows the percentage of upcycled material used to make each product. In with the old, out with the new! We are thrilled and excited to have our products featured on The Grommet today! Rachel here from Alchemy Goods. We are Seattleites, cyclists, and passionate about the environment. We believe that beautiful, useful products don’t have to be created from new materials- and don’t have to be made overseas to be affordable. Since 2005, we have reclaimed almost 500,000 used bicycle tubes destined for a landfill and given the material a second life. All our goods are made in Seattle, WA and come with a lifetime guarantee. Every purchase made helps us continue the cycle of Reclaim, Remake, Reuse! I've got one of your messenger bags... and I always get compliments how unique and stylish it is. One question - Where do you guys collect the inner tubes from? I have a ton of old bike tubes that I've always thought were of use, but never knew where to take them (I hate putting them in the trash). Can we donate them to you guys somehow? @Jon I'm glad you like your Ag bag! We have a tube collection partnership with retailers all over the US. You can drop off old tubes at any store that sells Trek Bicycles, or at REI, or hundereds of local bike shops. For more info on how and where to recycle your old bicycle tubes, please see our upcycling page on our website: http://www.alchemygoods.com/upcycling.html thank you!! @Rachel Very cool. Thanks Rachel. I really dig what you guys are doing. How much does the toiletry bag weigh? It sounds perfect for travel but I want to stay as lightweight as possible. @Ginger Great question! The toiletry bag weighs 10.8 oz. It's a comparable size/weight to traditional toiletry bags on the market. Please consider making an xxl belt. Eli Reich knows how to find the silver lining… and then reduce, reuse and recycle it so none of the optimism is wasted. When his messenger bag was stolen, Eli started thinking about how to make a replacement. 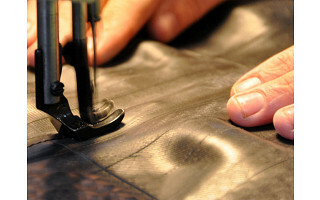 Working with a pile of extra inner tubes, he started sewing. Today, Eli’s company, Alchemy Goods, transforms blown-out inner tubes, old seatbelts and advertising banners into new bags and accessories -- and he thanks the messenger bag thief for the creative inspiration. Eli’s Ballard belt is made from reclaimed bike tubes that stretch just enough to be comfortable but won’t lose their shape. It comes with a removable steel buckle. For grooming essentials, the fully lined Elliot Toiletry Bag has a water-resistant exterior made from truck inner tubes and a zipper pull made from a tube valve.